Hawaiʻi students are invited to join the first annual Plastic Free Hawaiʻi Youth Summit. 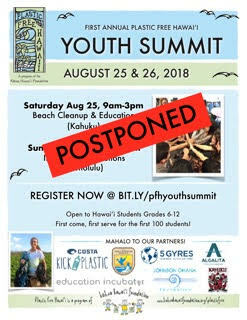 We are in the process of RESCHEDULING the Plastic Free Hawaiʻi Youth Summit due to Hurricane Lane. Registration is still open at this link. This summit is open to students and teachers grades 6-12 who have an interest or passion in tackling plastic pollution. Sign up now! If you have additional questions, please email [email protected].